The John Wayne archives boast thousands of never before seen letters from fans, celebrities, heads of state, presidents and many others. Key treasures are the many personal notes and letters from John Wayne himself. Many of them unopened until now! John Wayne left a legacy as the quintessential American and leading man - one that we may never see again. In these letters and chronicles we assemble a story paired with rare photos from the family albums. This compendium lets you see inside the man. What he was facing, his circle of friends, his world views as well as his unmatched patriotism. This is so much more than a collection of letters. Duke In His Own Words uses these many voices to talk about John Wayne the American. It's filled with emotion, patriotism and insight, and it’s and narrated by Ethan Wayne. These letters collectively form a special time capsule of a man beloved by many. John Wayne also loved to write letters to friends, fellow actors, family and politicians. All of that is captured here. 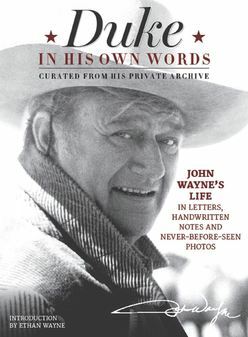 Through John Wayne's personal correspondence, we share John Wayne's most intimate thoughts and the advice he shared with friends , family and world leaders.